With people who (used to?) play with Crowbar and Soilent Green, you would expect many things but certainly not an old school black metal outfit. Goatwhore show on their third album A Haunting Curse that you don't need gallons of corpse paint to take a dive into the archaic times of the birth Satanic heavy metal music. 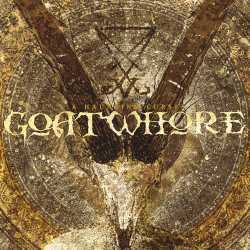 Your anticipations may be disappointed if you want to hear some Darkthrone or Immortal influenced sounds; Goatwhore are way too sophisticated for that. Instead this comes across like a time travel more than twenty year into the past, when European bands like Sodom, Hellhammer and Bathory tested the possibilities of a dirtier kind of metal music. Apart that Goatwhore have a contemporary production, everything else is right in place: primitive thrash metal combined with the intensity of black metal, always at its best when they switch to doomy mid-tempo parts. A Haunting Curse is anything but an original album, but it works very well as an exercise in musical history lessons, showing that old school metal can also sound very cool with a clean sound. Unlike the boring modern outputs of the genre's pioneers, Goatwhore manage to play forty minutes of old school thrash with enough room for highlights. A Haunting Curse is certainly not a must-buy, but old-school thrashers and nostalgic black metal fans will sure enough get their kicks out of it.